Nigeria-eligible striker Tammy Abraham will not be returning to Chelsea in the January transfer window. The Blues had the option to recall the England U21 international from his loan spell at Aston Villa but did not trigger the option by the set date, January 14. 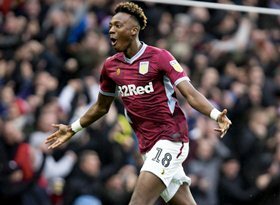 Abraham was heavily linked with a switch to a couple of Premier League clubs, with Wolverhampton Wanderers favourites for his signature but he'll be staying put at Aston Villa until June 2019. Having missed the Emirates FA Cup clash vs Swansea City, the proposed move to Wolves looked dead when he featured for Aston Villa in their 3-0 loss to Wigan Athletic on Saturday, January 12. The 21-year-old joined The Lions in August 2018 and has made 21 appearances, scoring 16 goals. Abraham has previously played on loan at Bristol City and Swansea City.